In a deal agreed yesterday, I am very pleased to confirm that UKEM Records is now the ‘Official UK Distributor’ for the mighty Sevared Records!! This means i will now be bringing all of the labels new releases into the UK as well as re-stocking selected older titles. Having traded with Barrett and Sevared Records for some years this is a step up in our partnership and Barrett seems as excited as i am for this new venture. More news on new releases coming soon! In a deal agreed yesterday, I am very pleased to confirm that UKEM Records is now the ‘Official UK Distributor’ for the mighty Comatose Music!! Having traded with Steve and Comatose for some years this is a step up in our partnership and Steve seems as excited as i am for this new venture. Details of more new releases to come in will follow soon! UKEM Records are very pleased to announce the signing of Cornwall based death metal band HUMAN MYCOSIS!! Having heard the band’s debut e.p. ‘Scattsville’, I knew it was a band that would sit very well on the label’s roster, but it was their appearance at this year’s ‘UKEM: Disciples of Extremity’ all-dayer that really affirmed my determination to have them on the label, having put in an absolutely punishing and devastating performance, gaining praise from many in attendance that day. The band has honed their live performances supporting the likes of Unfathomable Ruination, Desecration, Inebrious Incarnate, Warpath, Monolithian, Warcrab and Ascaris. New Death metal finally back on the label – feels very good! Hopefully everyone else thinks the same!!! Planning on attending this years Bloodstock Festival? UKEM Records is a BOA affiliate which means you can purchase tickets for the festival via our affiliate link! The link takes you to the normal ticket ordering site and is registered to UKEM. Simply click on the banner to be directed to the Bloodstock ticket site! Very pleased to reveal the cover art for the forthcoming album from thrash metal band Solitary which has been produced by Andy Pilkington at Very Metal Art. 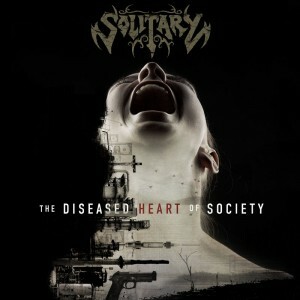 Titled “The Diseased Heart of Society” and featuring 10 tracks of aggressive UK thrash metal, the genre has never sounded more potent and powerful than it does in the hands of the UK’s Solitary. Adding that final touch of class, Stan Havard from friends Xentrix laid down some blistering guest lead guitar work!!! Legendary producer Simon Efemey (Amorphis, Paradise Lost, Napalm Death etc) was brought on board to ensure the perfect sound, which he has achieved hands down! Links are now active for pre-orders, with package deals limited to just 50! 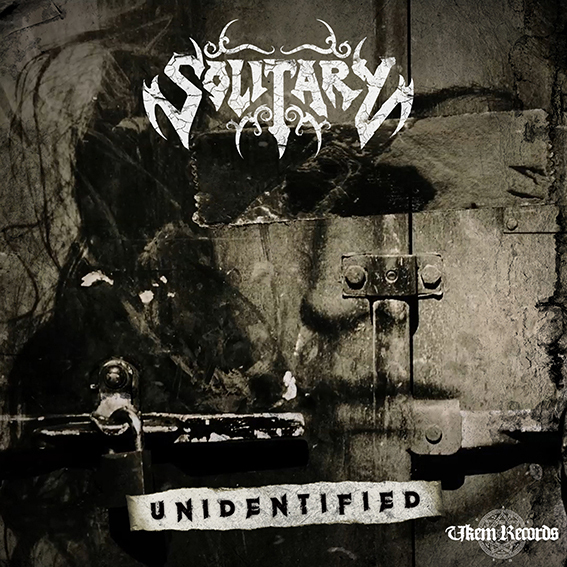 UKEM records are pleased to welcome extreme thrash band SOLITARY to the labels roster!! 2017 promises to be an incredible year for Solitary as they forge ahead in partnership with UKEM. Along with the release of the album there will be a host of prestigious live shows with a prime slot at Hammerfest and playing alongside UK thrash stalwarts Acid Reign, in London, already confirmed. 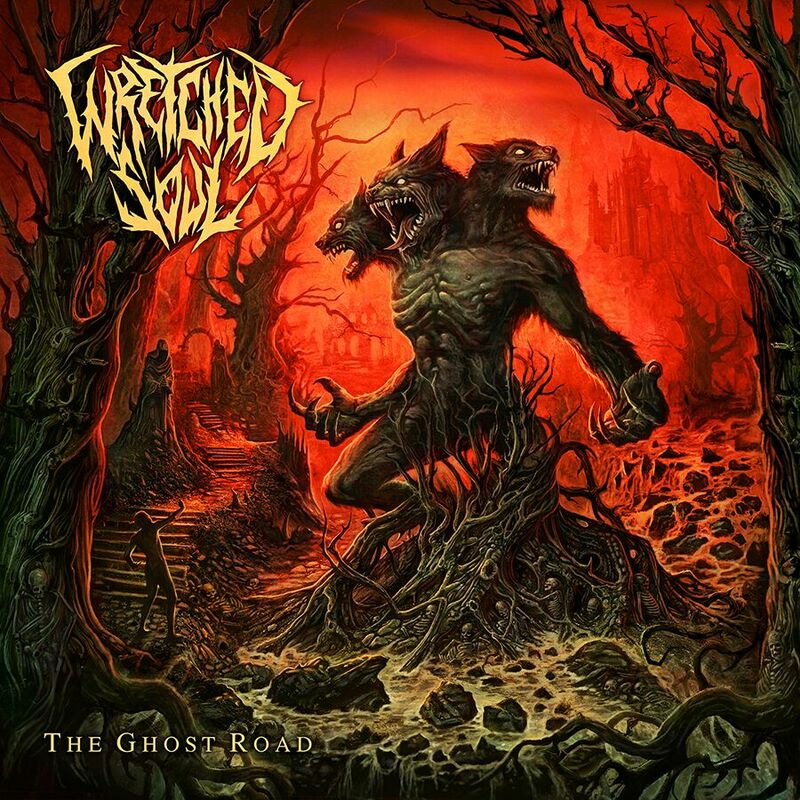 Wretched Soul – More Release Details announced! 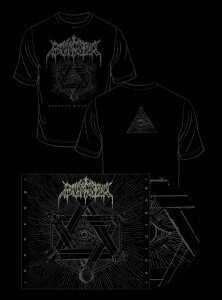 CD Digi-Pack | CD Digi-Pack & Shirt Package Deal | Digital. European distribution and worldwide digital distribution is once again via Plastic Head. 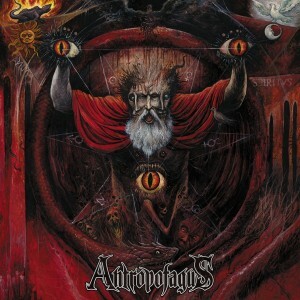 Cover art is via renowned artist Dan Goldsworthy (Accept, Hell, Sylosis etc.) – im sure you will agree that it is a stunning cover and definitely suits the bands style perfectly! There are 8 tracks in total, all of which absolutely slay! However, the exclusive CD & Shirt package deal will be available very soon, the shirt featuring the cover art and limited to 50 packages, so if your’e interested in the shirt and cd, hang fire – the link will be available very soon!! Finally, please share this post, spread the good news!!! 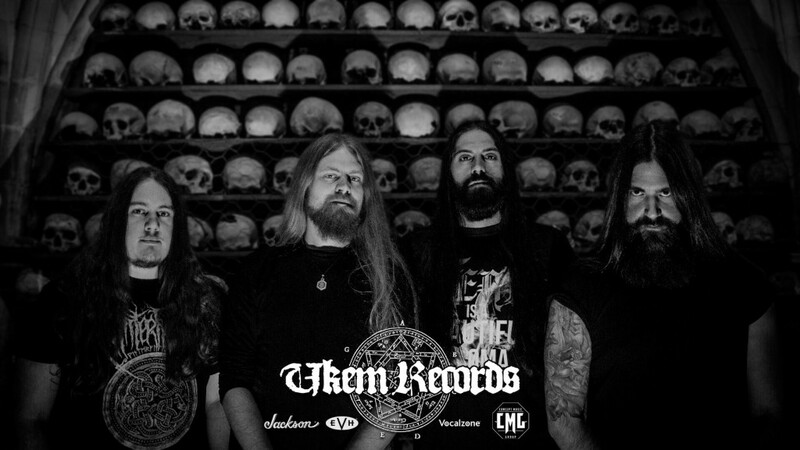 UKEM Records are extremely pleased to welcome to the roster Blackened Heavy metal outfit WRETCHED SOUL. Following periods of relentless gigging around the UK, the band has honed an exciting and unique sound all its own, with their potent melding of Death, Thrash, Black and Traditional Heavy Metal offering brutality and melody in equal measure. 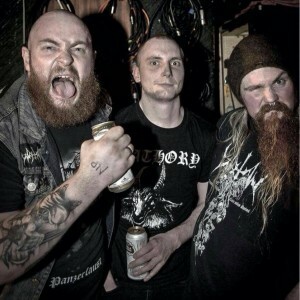 The band has quickly gained an international reputation for their intense and genuinely engaging live shows; participating in tours with Onslaught, Nervosa, Orange Goblin, Savage Messiah, Vreid, Mercenary, Omnium Gatherum, Brutal Truth, Extreme Noise Terror, 1349 and Taake, among others as well as appearances at Bloodstock and Incineration Festival. The decision has been taken to launch a customer loyalty scheme, used as a ‘thank you‘ to everyone that shops in the webstore. It’s a very basic scheme in that for every order placed points are earned. Once a customer reaches 10 points they are entitled to a FREE cd with a value of anything up to £10. If you are a vinyl collector, save your points up and when you get to 20 points, chose a FREE vinyl! The software installed into the store keeps a count of points earned each time a customer buys from the store, so its going to be very easy. I will also ensure that every customers points total is being counted correctly and kept up to date. The labels next release is now available to pre-order! 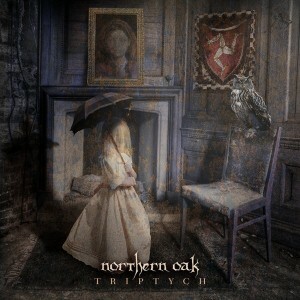 UKEM Records are very pleased to announce that we will be releasing ‘Triptych’ by folk/black metallers Northern Oak!! Originally planned as a digital only release via a Kickstarter campaign, a physical release will now see the light of day for those that prefer physical copies! This release was a ‘fond farewell’ to their fans, being the bands last release before they decided to call it a day sadly. No release date has been set, but the layout is already being worked on and will be released as a glossy digi-pack and will also feature some very special ‘bonus material’ to set it aside from the digital version and make this release that more bit unique. Also featured will be the three original tracks (24 minutes worth of music!!) alongside instrumental versions of each track. Release date will be scheduled very soon, so keep an eye out on the label page for more information. Very much looking forward to this release having been a fan of the band for many years now! Cavernous Records is proud to announce that we will be releasing the vinyl version of the ‘Unholy Sedition’ full length by purveyors of hateful black metal,Burial recently released on cd by UKEM Records. The recording is currently being remastered for vinyl by Luca Martello at H-Soundmusic and is scheduled for an August release. This is extremely good news for both the band and the label. Pre-Order information will be posted online soon! In another first for the label, we can now reveal that we will be releasing our first ever tape release! 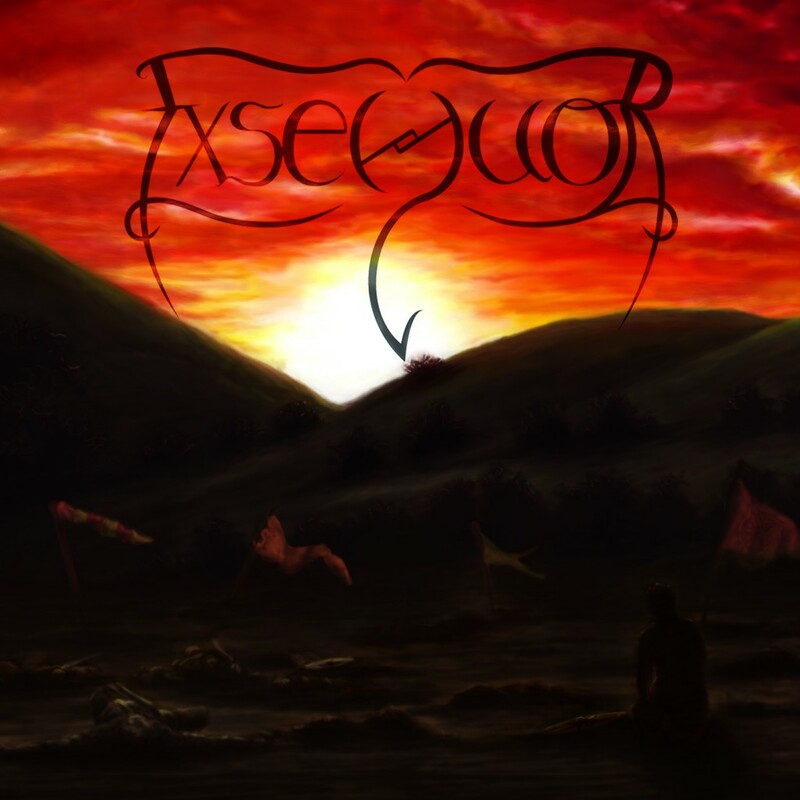 [UKEM-MC-001] This first release will be from Atmospheric Black Metal band Exsequor. ‘For The Fallen’ was originally a self-release CD, but now we are set to give this fantastic e.p. the label release it truly deserves! Release date is set for the 27th May. Limited to 100 units, the tapes will come in two variations, one yellow tape and one red tape. Side A will feature the ‘For The Fallen’ e.p. with Side B featuring the bands previously unreleased demo. Included in the booklet artwork will be an exclusive download discount code which will offer 50% OFF the original download price! Very pleased to reveal the details for the labels next release!! Featuring 10 tracks of scathing and hate-filled black metal – for fans of Tsjuder and (early) Satyricon. UKEM Records are extremely pleased to announced that renowned UK black metal band Reign Of Erebus are back and has joined the roster!! 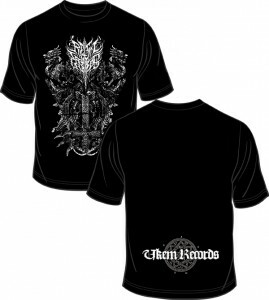 “After a 10 year absence U.K. Black metal band Reign of Erebus are back! Founding member and vocalist/bassist Cthonian has picked up the “reign’s” once again and is now working on a set with new members (the new line up in this unholy trinity is Cthonian on vocals/bass, Cinis on guitar and Shaun ‘Chaotic’ Black on drums). As well as songs from both the bands critically acclaimed albums ‘Humanracist and ‘The Inversion Principle’ the new line up is also working on new material which closely follows the ethos of the pure black metal rage that the band emanated a decade ago”. It is this new material that UKEM Records are set to release, featuring five or six tracks on an as yet untitled ‘come back’ e.p. A Summer 2016 release is anticipated, in both digi-pack and digital formats. Very exciting news for both the band and the label! To Celebrate this union we will also be releasing the exclusive ‘Coat of Arms’ short sleeve shirt – pre-order information will be available soon! A new age of black metal is upon us! Our biggest ever Winter Sale is now on! Featuring hundreds of titles all with 35% OFF. 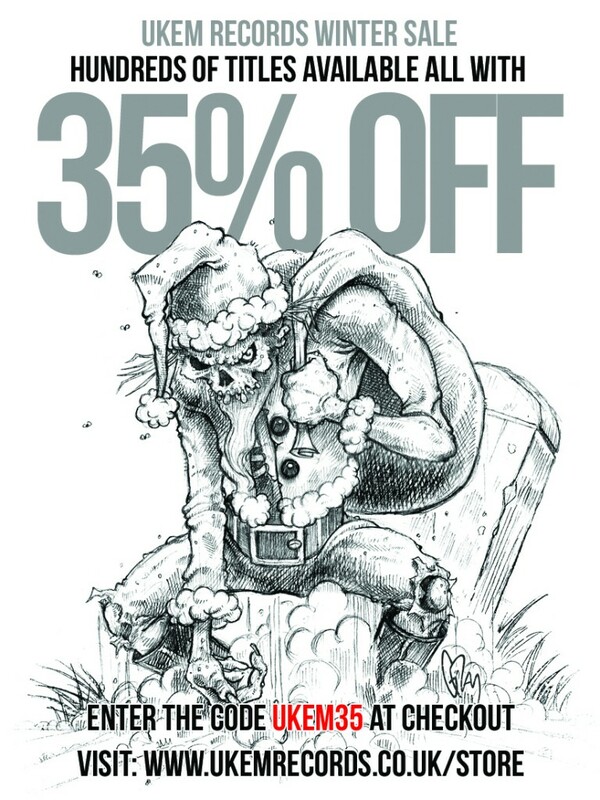 Visit the store and grab some festive bargains! The code can be used as many times as you want – tell your friends about it! 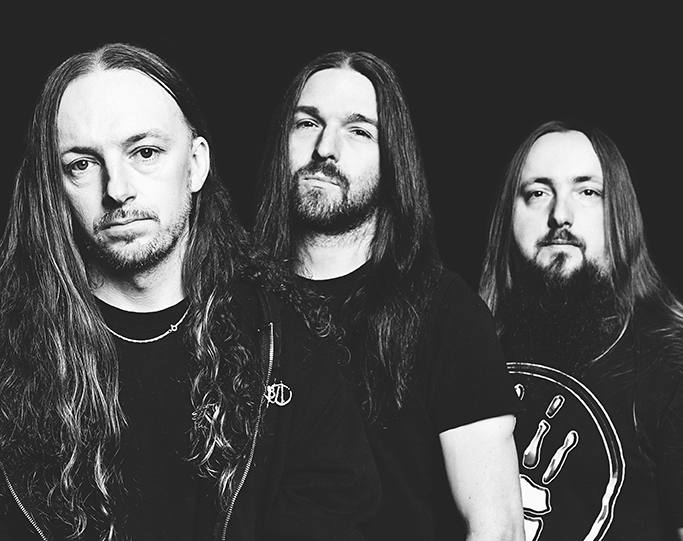 We very pleased to welcome to the UKEM Records roster Manchester based black/death metallers BURIAL. Initial discussions had taken place regarding the band joining the label some months ago. However, having witnessed the band’s devastating live performance at this year’s Byker Grave Festival (Newcastle), the decision for the band to join the roster was sealed that night! Burial are currently in the final stages of recording/mastering a brand new album which will be released in 2016 by UKEM Records, date to be confirmed. If you didn’t know, 2 of the 3 members of Burial are also in Wolfbastard, who are also on the label, so the great working relationship continues! 2016 is going to be a great year!!! Big new announcement in that i have decided to create a ‘sub-label’ for UKEM Records. I have resurrected Hells Hammer (the old distro name) to form Hell’s Hammer Music. The aim of this sub-label is to hunt down international bands from the extreme metal underground and give them a release! There is a fecabook page, Here but its going to be a while before anything of great substance is added with regards to updates, signings etc. Be great if everyone can head over and give it a like! 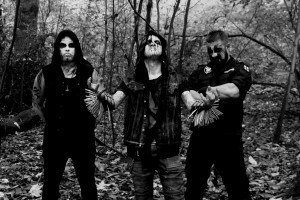 Hell’s Hammer Music are extremely pleased to announce the signing of black metal band PERSECUTORY. Hailing from Istanbul, Turkey, these three demons (TYRANNIC PROFANATOR (Vocals), INFECTIOUS TORMENT (Guitars & Bass), SEISMIC (Drums) engage in an extremely harsh brand of black metal. As the band them-selves quote “An impious trio decided to play morbid & malignant black thrash metal by keeping the perversion, death, chaos and SATANISM”. The band’s debut e.p. “Perversion Feeds Our Force” will be unleashed to the masses in early 2016 in both digi-pack and digital format. Prepare for Chaos! We have decided to extend the offer of the FREE cd’s for another week so that people who get paid on the last day of the month can take advantage of this fantastic offer. So this promotion now ends on Sunday 4th October! Even better is that with every order, not only will you receive your FREE ‘Surprise’ cd’s but there will also be a FREE Omnipotent Hysteria cd in every order! Please note that we have been ‘matching genres’ for the FREE cd’s. 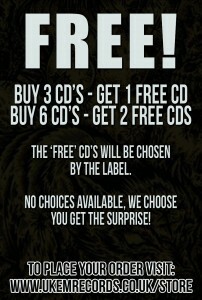 So if your order is mainly death metal, the FREE cd’s you will receive will be death metal etc.. 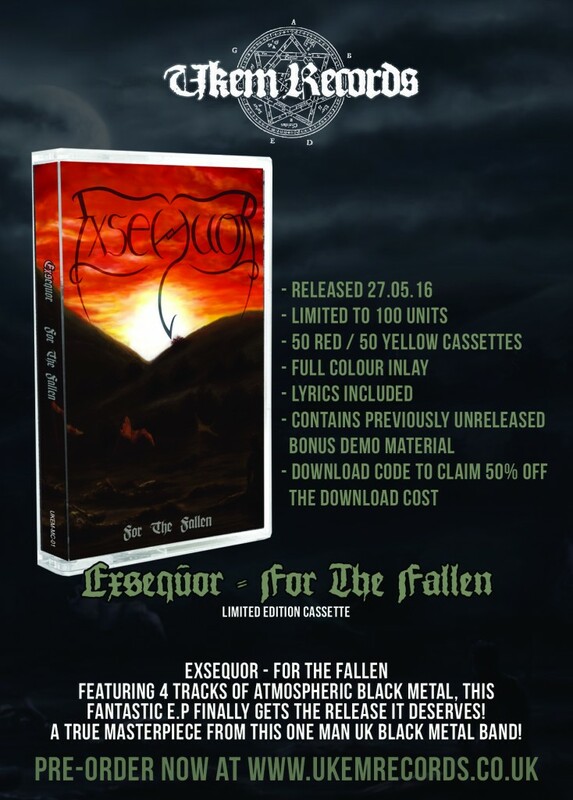 Unfortunately the planned release from Exsequor has been put on hold indefinitely. Gutted about this, but the man behind the band has his reasons. We have spoken today and are in mutual agreement that its the right thing to do for now. I am still hoping that a release will go ahead sometime in the future, but for now, the release in on hold. Whilst speaking to Drew (the man behind the band) he said “I have two new songs written, one of them being the strongest material I have written to date“, so hopefully, sometime in the future, UKEM will bring you a new release from Exsequor. Watch this space!